Sustainability Advertising: What is the Story of Stuff? From its extraction through sale, use and disposal, all the stuff in our lives affects communities at home and abroad, yet most of this is hidden from view. 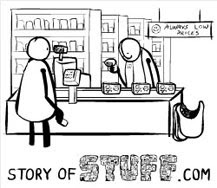 The Story of Stuff is a 20-minute, fast-paced, fact-filled look at the underside of our production and consumption patterns.